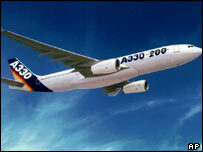 Indian Airlines will buy 43 planes from European producer Airbus in a deal worth $2.2bn (£1.2bn). Prime Minister Manmohan Singh announced the deal on the first day of a summit between India and the European Union. Demand for air travel in India is increasing as strong economic growth boosts consumer spending power. Low cost airlines have begun offering domestic and international routes and analysts are predicting further expansion in the industry. Indian Airlines is feeling the pressure from the increased competition and is hoping that the new planes will allow it to retire older jets and lure customers with its improved and more comfortable service. No details were given about the type of planes being bought by Indian Airlines, but press reports speculated that they would be from the A-319, A-320 and A-321 ranges. Wednesday's deal comes three months after Indian low budget airline IndiGo ordered 100 Airbus planes worth some $6bn. "We hope to raise our co-operation in the aviation sector," Prime Minister Singh said.